I needed a new outfit for a wedding but didn't have time to sew one, so I decided to make a jacket to cover an old one. It took about an hour. I got lots of nice comments about it. 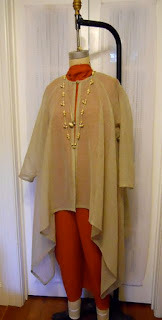 It is made with a sheer fabric that is more stable than chiffon but draped nicely. The construction is two sleeves and one body with a bias finish around the neckline that ends with a loop and a chinese knotted button. I wore it over a rust silk top and pant.